You’ve already seen my break down of the actual fight, but I just couldn’t resist that screen grab of Wayne Newton. 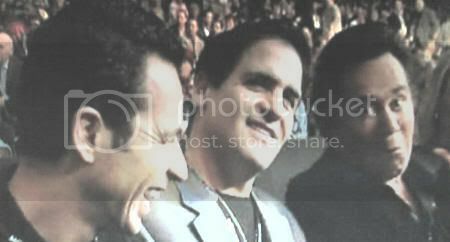 Unbeknownst to me, Mark Cuban, Helio Castroneves, and Wayne Newton, were all in attendance Saturday night to support their Dancing With Stars buddy, Floyd Mayweather Jr. Not only were they there to cheer the man on, but they also formed part of Mayweather’s entourage as he entered the ring. Can you picture a more excited man than the delighted Mark Cuban, who entered bearing a few of Floyd’s championship belts? 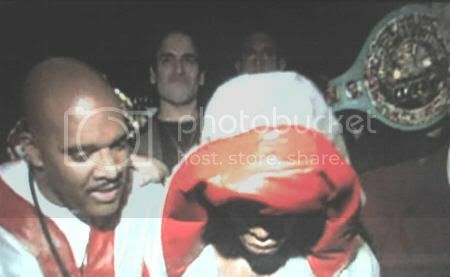 To think, Cubes actually abandoned his Mavs for a night to be at this fight. Judging by the smug look on his face, he couldn’t have been more proud. I do have to say, Josh Howard would not be pleased.